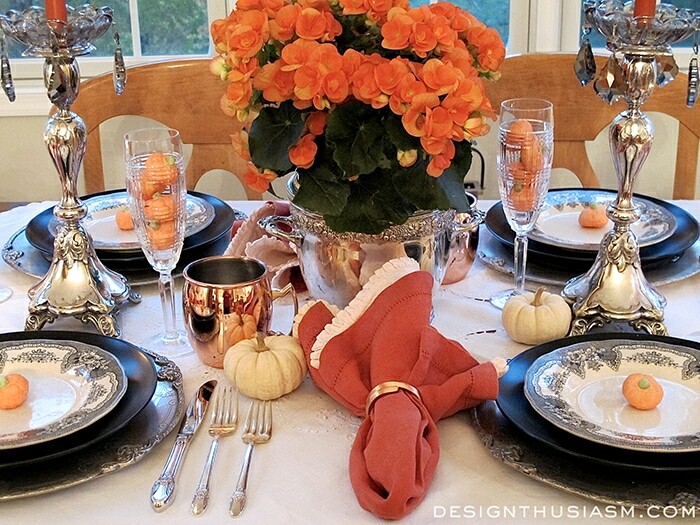 There’s no question about it… I love seasonal decor and thematic table settings. But I also feel compelled to keep my decor reflective of my style, maintaining a casual elegance while steering clear of the kitsch. 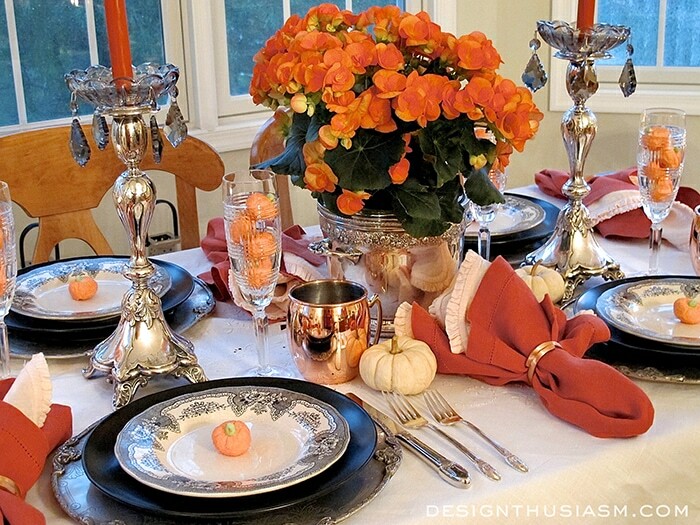 Every year at this time, I take up the challenge of creating a Halloween table setting that both clearly reads “Halloween”, yet embodies enough class for adults to enjoy a lovely evening meal. The color palette is, for the most part, pre-determined, but there are many ways to do orange and black. I love to combine varied burnished tones to communicate orange without necessarily being Crayola pure. 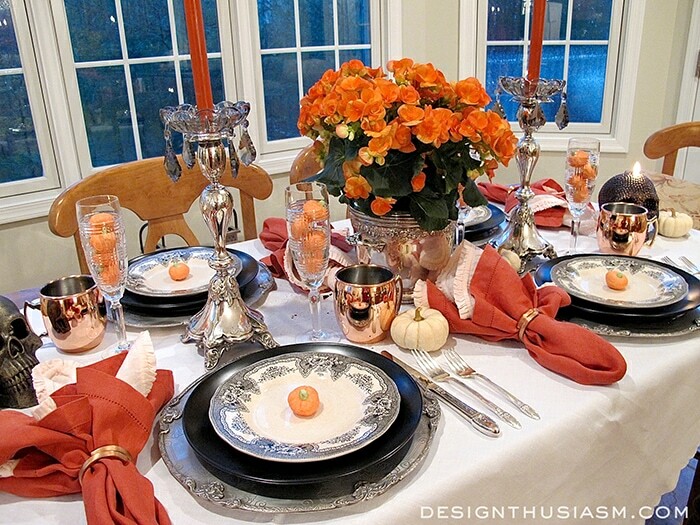 In this case I was playing with copper, blush and washed russet and the hues blended nicely to give off a warm aura. Halloween is easy to channel because where else do you ever see orange and black? But black, too, can be done with subtlety and charm. The plate stack in this setting utilizes heirloom salad plates from Williams-Sonoma, solid black Hudson dinner plates from the same source and a stunning silver metal charger with French decorative edging. 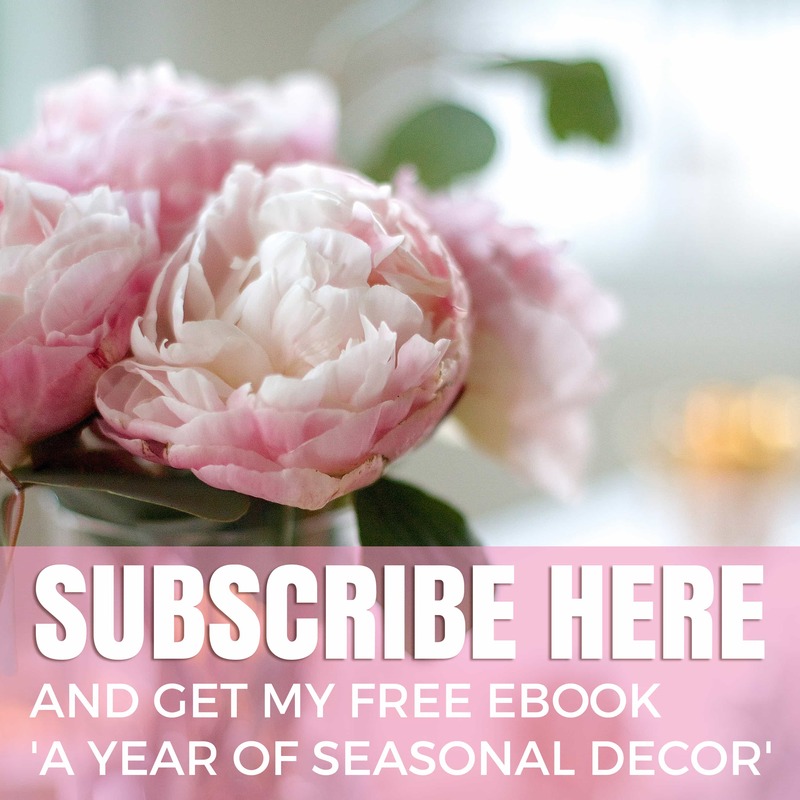 I’m often searching for alternatives in my autumn florals to the ever-present mums or simple orange roses. 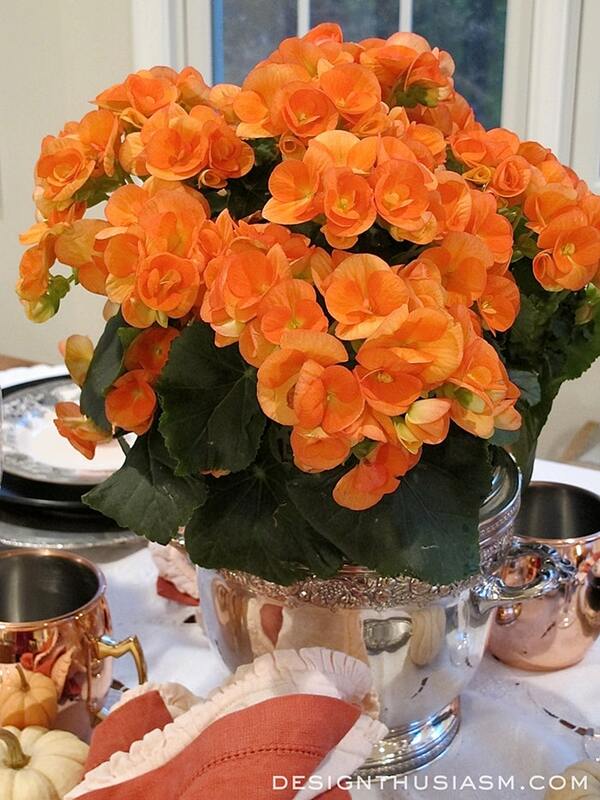 This year I used a sweet potted begonia to add a little cheer to the dinner tableau. I did let a little Halloween imagery work its way onto the table via pumpkins and skulls, but I tried to keep them decidedly kitsch-free. 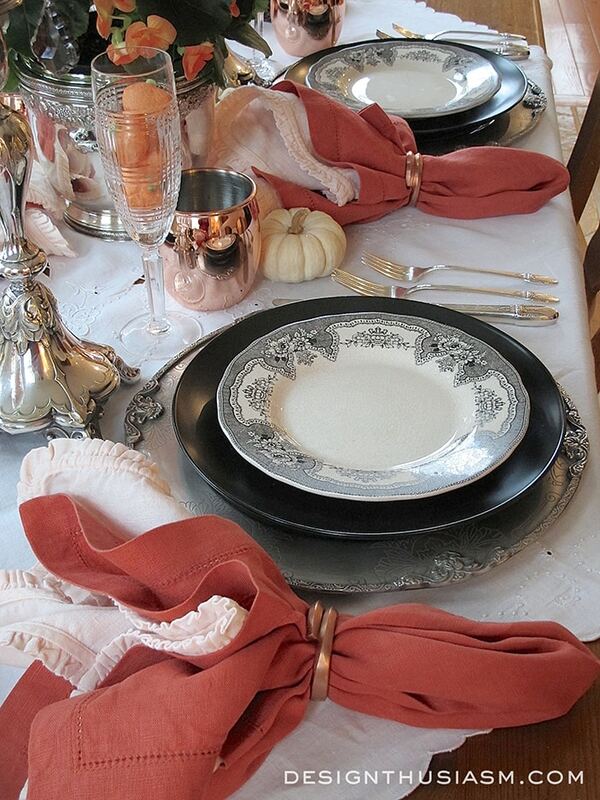 Ralph Lauren glen plaid champagne flutes are filled to the brim with Pumpkin Marshmallow Treats. The table is flanked with two skull candles, one a holdover from last year (from my Halloween wine tasting)and a new one to join the party. 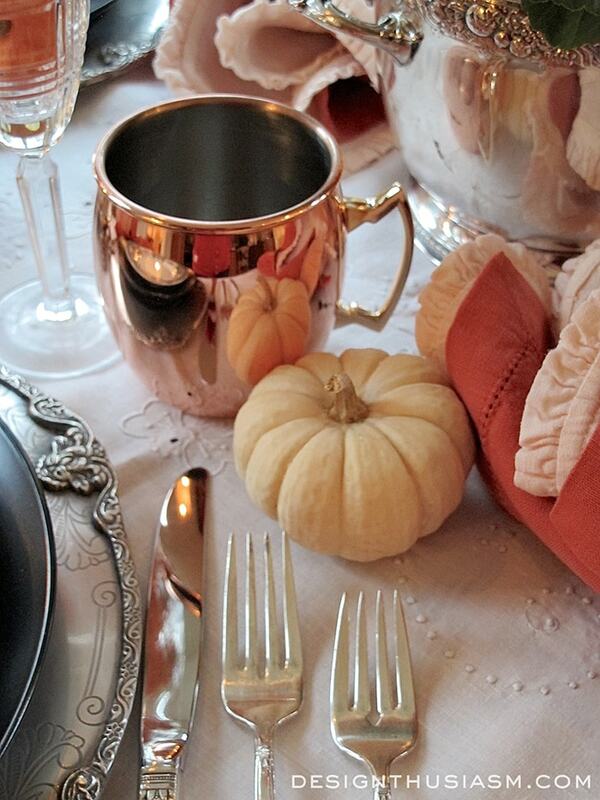 Copper mule mugs add a richness to the scene. 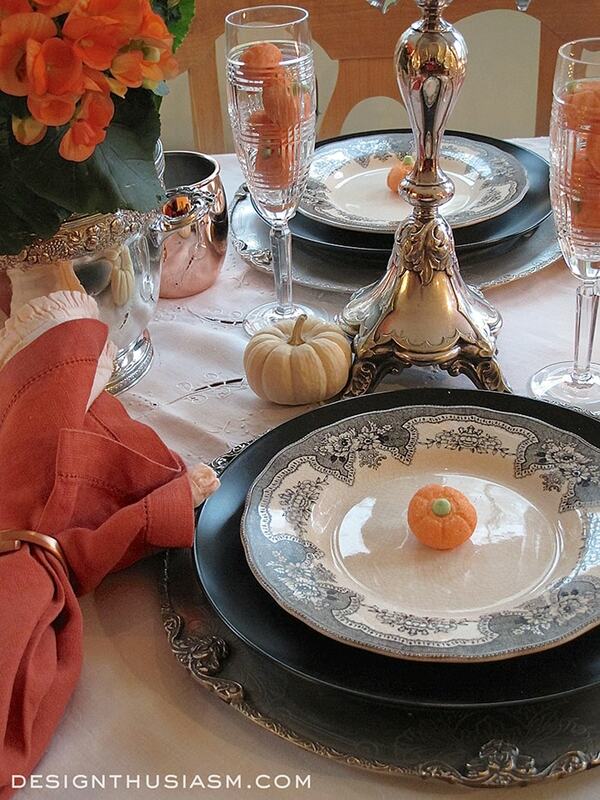 The table is sprinkled with a handful of mini white pumpkins, which I love for their understated grace. 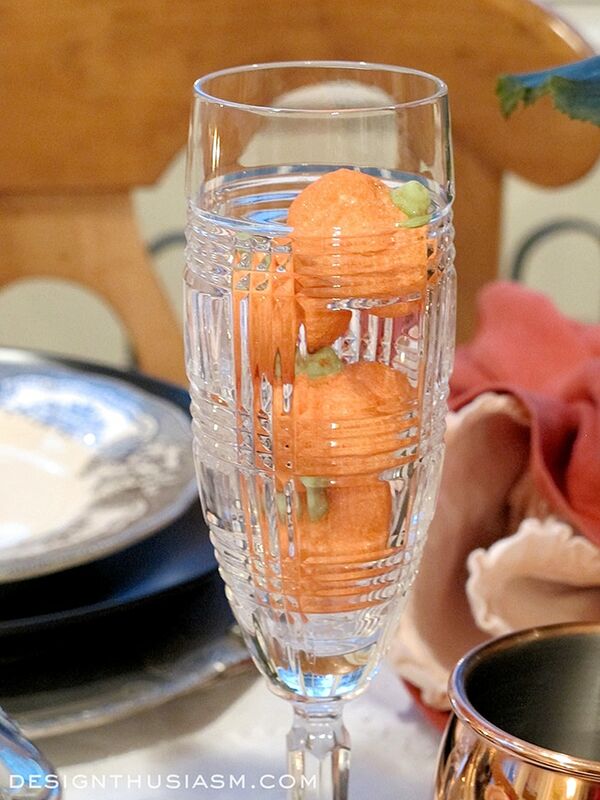 They work so well with my ‘not-quite-orange’ oranges in my color palette. 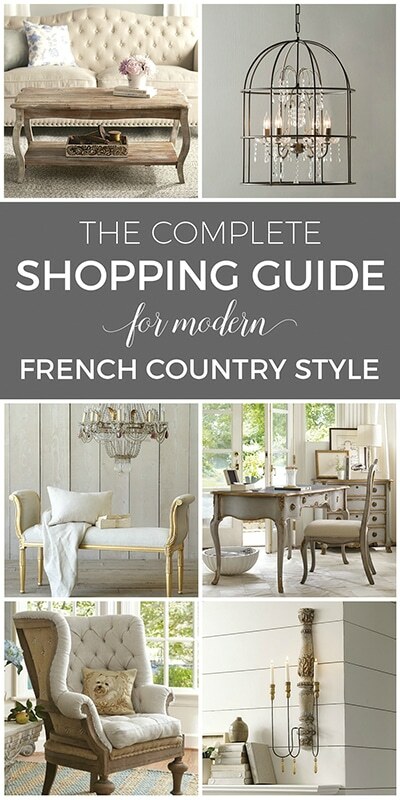 The underpinning beneath the whole presentation is a vintage white linen embroidered tablecloth. 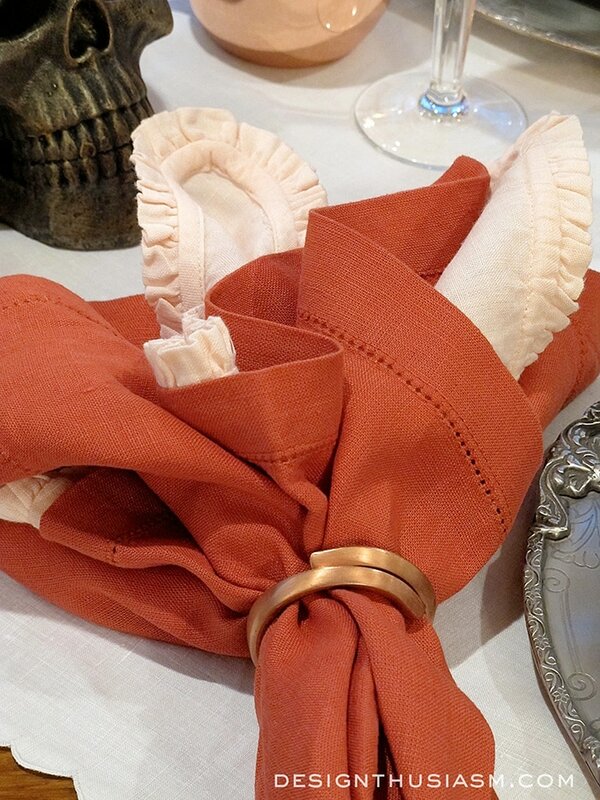 Layered linen napkins offer a top piece of washed russet hemstitch from Pottery Barn playing off a ruffled blush under napkin from Pom Pom at Home. 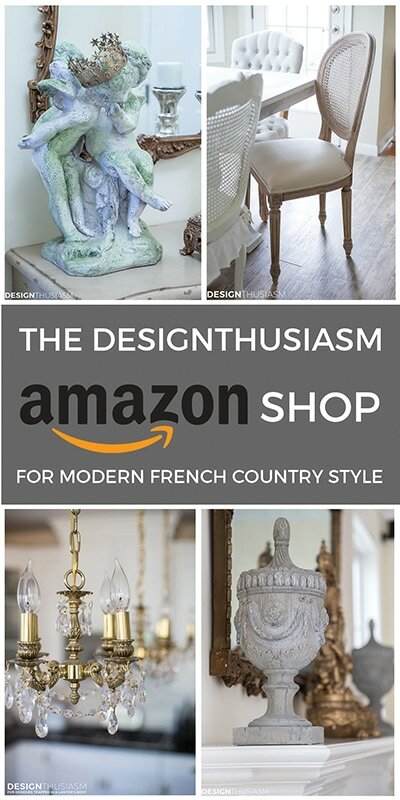 The setting is peppered with silver pieces to drive home the elegant feel. 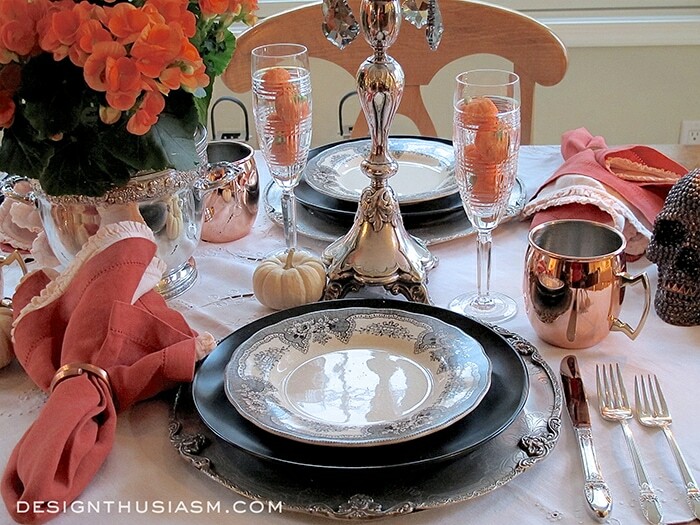 The centerpiece sits in an antique silver ice bucket and the flatware is family heirloom silver. Copper napkin rings encircle the napkin cluster. One of my absolute favorite purchases from my overseas travels is a pair of silver candlesticks bought from an antique market in London. You can see the stunning detail work on the foot of one of the pieces. As the sun sets on this Halloween tableau and evening sinks in, the table glimmers and invites guests to sit down to dinner. For more elegant Halloween decor ideas, check out my Halloween House Tour. Linking with BNOTP, Dwellings Amaze me Monday, A Stroll Thru Life Tuesday, The Scoop, Savvy Southern Style Wednesdays, Pocket of Posies, Jan Olson Thursday, The Vintage Nest Share Your Style, From My Front Porch to Yours, The Creative Exchange, Feathered Nest Friday, Romantic Home Friday, Shabby Nest Frugal Friday, One More Time Events, Crafts a la Mode Weekends, Sundays at Home. 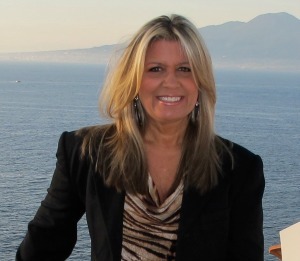 Denise – thanks so much! What a lovely thing to say… 🙂 Actually, the candlestick, if I remember correctly, were not a fortune because they were from an antique shop. They do have their imperfections (not perfect straight for one thing), but I still love them. Thanks for stopping by! So pretty, Lory. Love those black and white plates with the copper. Thanks, Kim! They reminded me of lace and felt Victorian or Gothic, so for some reason that said Halloween to me. And I’m all over copper this year. Trying to come up with something different for Thanksgiving though, just to switch it up… 🙂 Thanks for visiting! 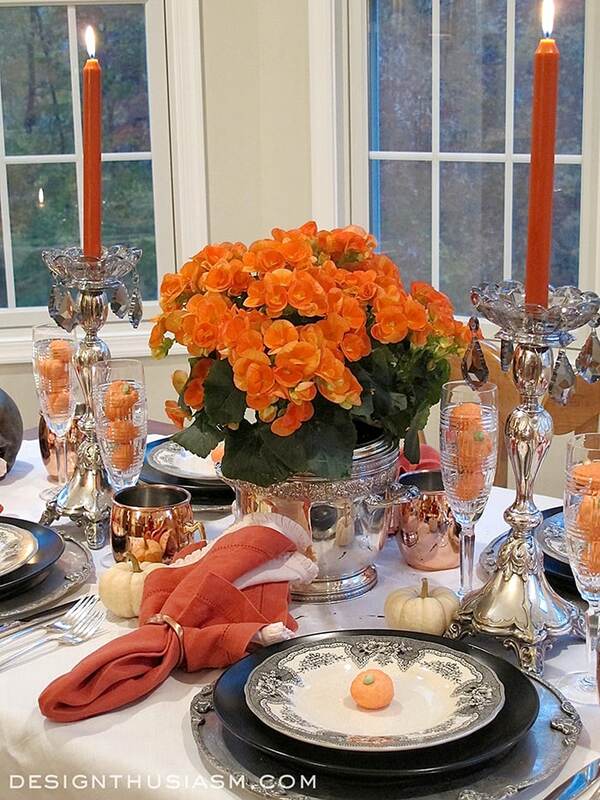 Lory, your table setting is stunning! Love how the color complement each other….. So elegant and not over done….. Thanks, Maritza! It’s fun when others appreciate the more subtle route to Halloween, too… 🙂 Thanks for taking the time to comment! Thanks so much, Jenna!! I just love the warmth of copper and it’s so much more subtle than straight on orange… 😉 Thanks for popping in! What a perfectly gorgeous table. Love the colors. 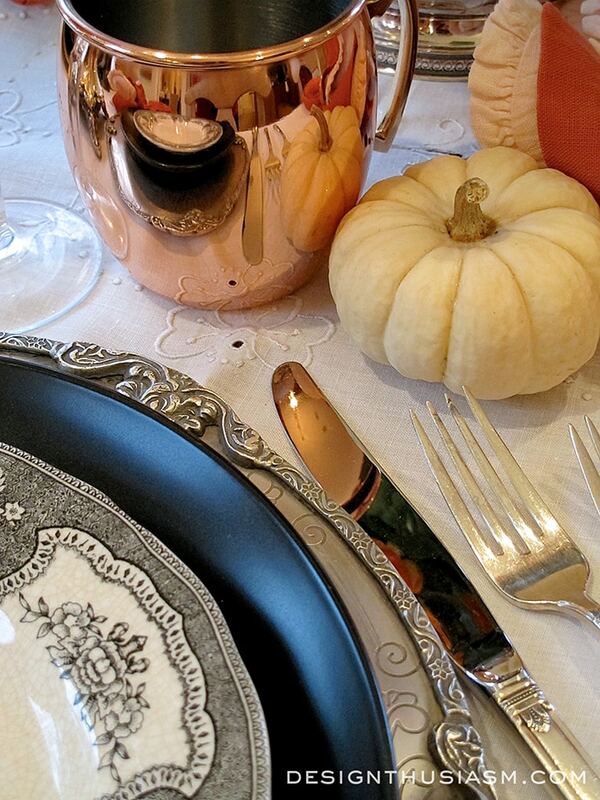 Your table fits the season. Thanks so much, Valerie! It’s such a fun season to play with, isn’t it? 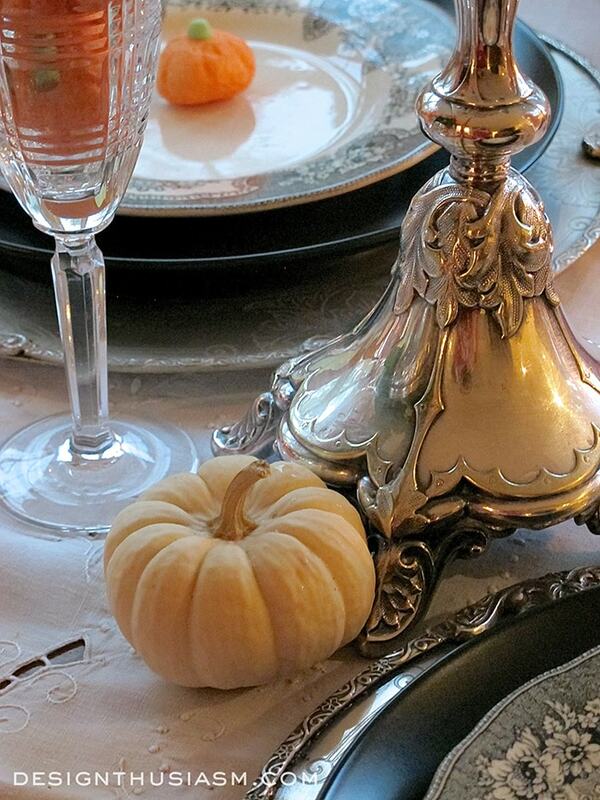 Lory, that’s probably the most elegant Halloween table I have ever seen. 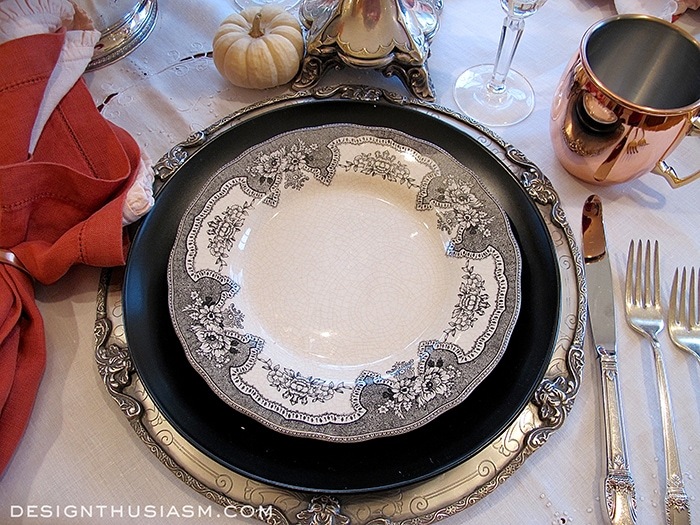 Love the black transferware plates! 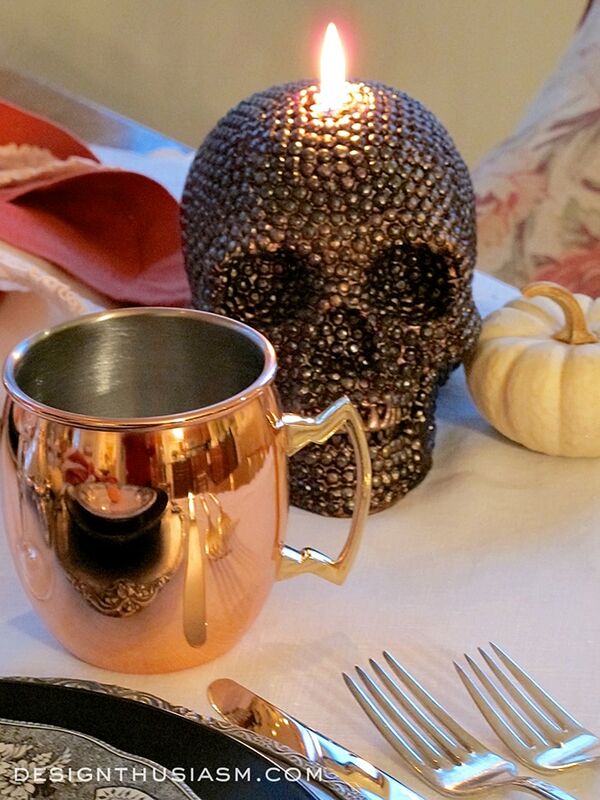 The touches of copper and the skulls are a fun addition. Thanks for sharing with SYC. My pleasure, as always. 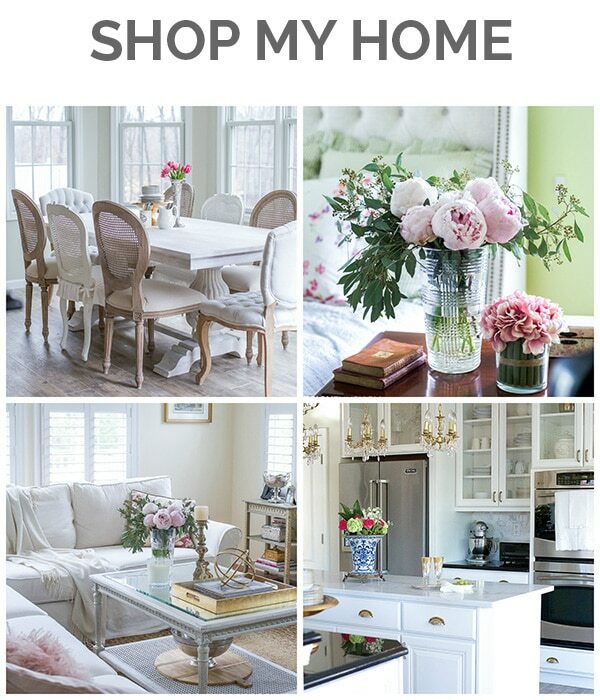 Thanks so much for hosting, Jann!! And thank you so much for the kind words… 🙂 This one was a lot of fun.